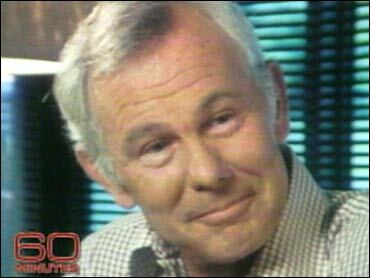 Johnny Carson, the former Tonight Show host who's avoided the public eye since he retired from the show in 1992, still watches late-night television and stays in touch with friends including David Letterman. "Johnny is alright," his friend, Peter Lassally, told reporters Tuesday during a press conference to promote "The Late Late Show" on CBS. Carson, 79, stays in contact with a small group of friends who rarely talk about their interactions with the man who reigned over late night programming for three decades. So, when Lassally started talking about Carson, reporters jotted down his comments and asked for more details. "As you know, he has emphysema," said Lassally, a former executive producer of the Tonight Show. "Recently he had some breathing problems. He's fine. He's just fine." These days Carson gets his dose of late-night programming during prime time in California, watching shows over East coast feeds. Lassally didn't say whether Carson watches The Tonight Show, now hosted by Jay Leno. But he's a fan of Letterman, whose career took off when he became a regular on The Tonight Show with Johnny Carson. "I think the thing (Johnny) misses the most is the monologue," Lassally said. "When he reads the paper every morning, he can think of five jokes off the bat that he wishes he has an outlet for." Carson sends some of those jokes to Letterman, who occasionally includes them in his monologues at the beginning of each show. "Johnny gets a big kick out of that," said Lassally, who talks to Carson regularly by telephone. "He's still interested in literature and politics and all worldly things that always interested him," Lassally said. The two men teamed up in the 1970s, when Lassally got a job as an associate producer on The Tonight Show. He gradually moved up the ranks on the program's staff, becoming executive producer in 1990. Craig Ferguson is the latest talent that Lassally has worked with over the course of a career that began in radio during the 1950s. Besides Carson, he's worked with Arthur Godfrey, Mike Wallace and Letterman.